Impact windows prices vary and can cost anything from $500 to $1,300 for a fully installed window. 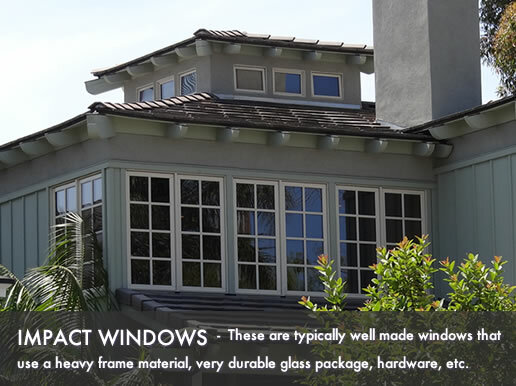 These are typically well made windows that use a heavy frame material, very durable glass package, hardware, etc. Of course the price you will pay is determined by the type of window frame you choose, the window rating, which glass package you have chosen, the manufacturer and the installation process. Refer to our window replacement cost estimator for additional pricing details. When choosing an impact window at the entry level price, expect a vinyl or composite frame with very limited color options. These will typically only include a clear glass package, a very select number of colors for the frame, a low endhardware selection and no upgrades to the frame itself - fills, chambers, reinforcement etc. Standard window prices vary in price anywhere from $500 to $650. These are usually a low end wood clad option or a higher vinyl option. Sometimes they are offered with wood on the inside for visual appeal with fiberglass on the outside. These windows will have a reinforced frame, additional chambers in the fram, spacers fills and other upgrades to the entry level products. The higher end of the market are often custom order windows or large windows. They will be offered with a fiberglass or aluminum exterior and a wood clad on the inside for visual appeal. Expect more options to the frame color and finish. The glass package will be a high end low-E with an argon or krypton fill, they may also include foam insulation. The glass material may be what they use when making bullet proof windows, this material is called SGB, and it is a hard and stiff material. The cost to install can vary dramatically - $100 and $400 for each opening. The price is determined by the amount of work needed during installation. If you have chosen a larger window where the existing space needs to be enlarged, you can expect to pay the higher end of the installation cost, where if it is just a simple insert, you will pay closer to the lower end of the scale. Builder grade windows prices start at $500 and top out at $700 for each installed window. Standard grade windows prices start at $700 and top out at $900 for each installed window. Premium grade windows prices prices start at $900 and top out at $1,300 for each installed window.